Is it really already that time of year again? The Super Bowl party invites have been sent and you are undoubtedly going to be surrounded by a crowd of people, some of which are there for more than the food and commercials. If you are clueless to the football world, as am I, but find yourself wanting to impress your friends, boyfriend or husband, you’ve stumbled upon the right blog. I used to be single. 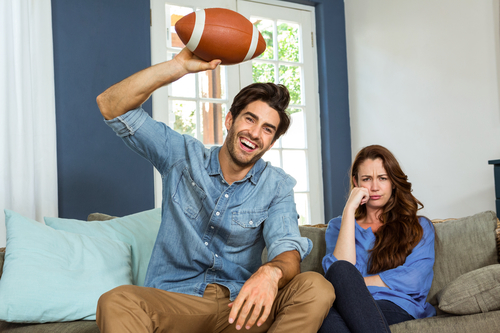 During that time, Super Bowl Sunday often meant an opportunity to be around single men and try to see if any possible relationships could exist. Over the years I learned that it helps to at least pretend that I like and understand football in such a setting. Now, as a married woman, I still find myself creating a cheat sheet for big games just so I sound impressive. I figured I could share this year. I had two loves growing up: youth group and softball. I got a high from both of those activities that nothing else gave me. But more than all of that, I can truly say that I had an unquenchable fire for the Lord that was growing inside of me at a very fast rate. And church fed that. I even wanted to be a missionary one day thanks to the influence I was gaining at church. I also loved softball. Scraped knees, dirt under the nails, and horrible tan lines were my fashion statement. I had dreams of playing ball in college, but I quickly realized playing high school ball three months out of the year wouldn’t get me there. It became a year-round effort that required me to play on a travel team as well.